With the most advance technology and material of Shanghai Sineo Microwave Chemistry Technology Co., LTD., MASTER serial ultrahigh throughput microwave digestion/extraction workstation was launched in 2012. MASETER cavity is versatile for 16-vessel independent frame-type high pressure digestion rotor, 18-vessel carousel integrated ultrahigh pressure digestion rotor, 40/100-vessel ultrahigh throughput carousel rotor and 16-200ml-vessel carousel large capacity rotor etc., meets different experiment application requirements. Other core technologies including airplane Xtra Fiber digestion outer vessel, quantitative Safety Bolt patented design, UTH-Caro design of high throughput carousel, unique piezoelectric crystal pressure measuring technology and Uni-Turn technology of one direction continuous rotation of digestion rotor in chamber, et.al. 1. 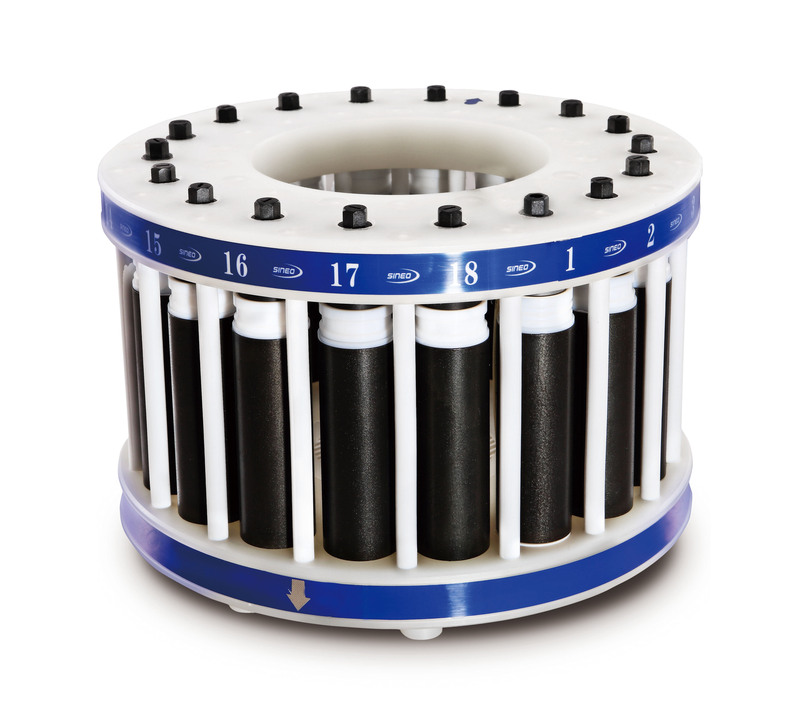 High-strength alloy carousel: higher pressure and better digestion performance. 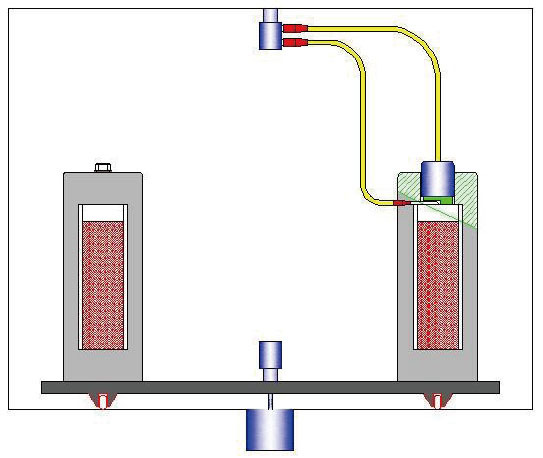 The high throughput vessel frame may homogenize the microwave field inside the chamber with the turning and stirring of frame vessel; therefore, up to 100 high throughput vessels may be heated evenly in the microwave field. 3. Safety Bolt: safer, more accuracy in result and higher recycling rate. 4. Uni-Turn technology, increased homogeneity and reliability. The whole set of digestion vessels was designed to rotate continuously in one direction, it breaks conventions of<360° back and forth rotation, avoiding uneven heating on vessels and reducing impact on turntable motor to extend service life. The temperature and pressure cables are short, that they are free from twisting in running and can be disassembled easily. Because of the high thermal conductivity of composite Xtra Fiber outer vessel and the efficient exhaust system, it only needs 15 minutes that the temperature cools from 200 ℃ to 60 ℃, greatly accelerates handling speed. The various convenient operation tools may lessen the working burden of operators and increase the preparation efficiency. Let’s take the flexible trolley as an example. Such device may help the experiment personnel to place the high throughput rotary table with fully loaded samples (weighing 15-20kg) in the chamber and take it out easily. 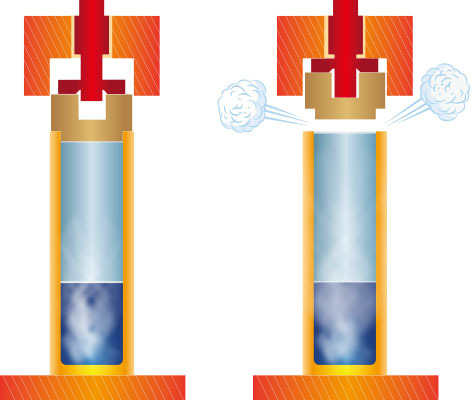 In this manner, the operator may not be required to contact the high-temperature and high-pressure digestion vessel directly and will not be injured by acid mist, perfectly ensuring the safety of the operation. The electric tool with fixed moment to close and open the digestion vessel may make the operation of high throughput digestion vessel rapid, simple and fulfilled. 1. Explosion-proof outer vessel made of composite Xtra Fiber, better than those similar products on the market. The composite Xtra Fiber material is light, thin, and having better hardness (better than metal) and good rigidity. Moreover, its pressure resistance and corrosion resistance performances are much better than PEEK (Poly-Ether-Ether-Ketone) outer vessel. 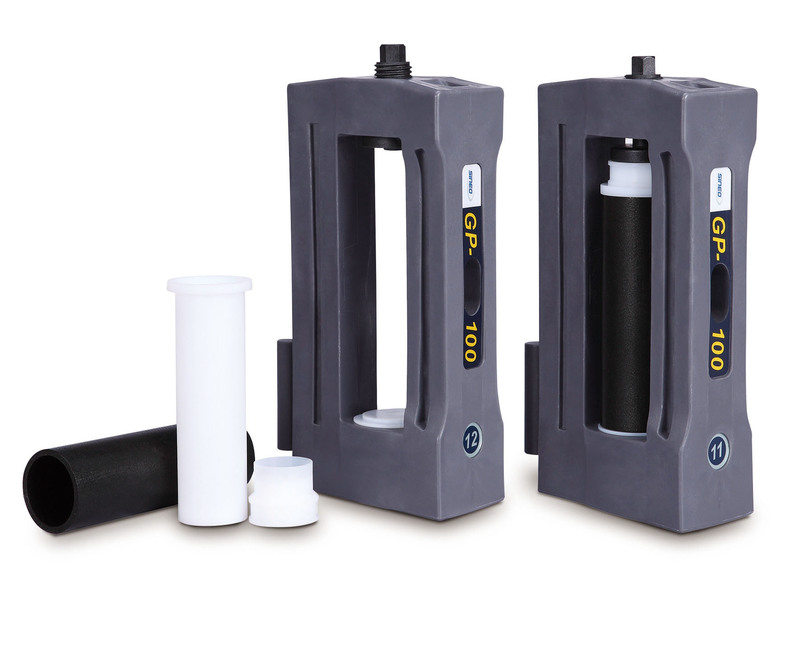 SINEO applies painted PFA processes, improves the corrosion-proof capacity by packing the composite fibers totally. Moreover, the high tensile invincible composite material may withstand pressure of 10000psi and temperature of 500-600℃. 2. Advanced and reliable pressure measuring technology by piezoelectric crystal. At present, the air-pipe is generally applied to transmit, measure and control the pressure inside the vessel for most venders. The air-pipe has apparent demerit that is too long, usually 400-600 mm in length. Hence, the digestion turntable shall rotate back and forth in 360 degrees to avoid the air-pipe being twisted. Besides, the samples in master vessel may be polluted easily, and it may not withstand high pressure to prevent breaking the air pipe. Therefore, after years of research and development, SINEO acquires the pressure measuring technology by piezoelectric crystal, reliable and durable. Such technology may measure and control the pressure under 12 MPa. The measuring and control cable is quite short, only 120-140 mm, therefore, there will be no twisting, sealing joint or leakage. Such technology allows easy operation and its greats merit is the absolute isolation of measuring and controlling component and sample, thus giving no chance to cross contamination. Integrating the technology of synchronous rotation of temperature-pressure device and digestion vessel with the rotary table in one direction and the patented technology of junction box, the turntable plate may rotate towards one directly constantly. The pressure control system is the standard configuration of SINEO’s product, more reliable than units with temperature monitoring only. Piezoelectric crystal is installed on the bottom or top of the vessel frame like an electronic balance, and the parameter of pressure will be delivered via electrical signal. The precise measurement and control of temperature inside the master vessel (Pt or optical fiber) combines with the IR temperature scanning, and the computer may identify the master vessel automatically and give the real-time comparison of temperature with standard vessel, more precise and reliable than only IR temperature measuring. Ultra high pressure and high temperature 18-vessel digestion vessel and carousel may work under 6MPa and 260℃, quite suitable for digestion of insoluble samples or closed microwave synthesis under extreme conditions. The strong magnetic stirring function is available for this configuration. 5. 200ml vessels for large volume sampling. 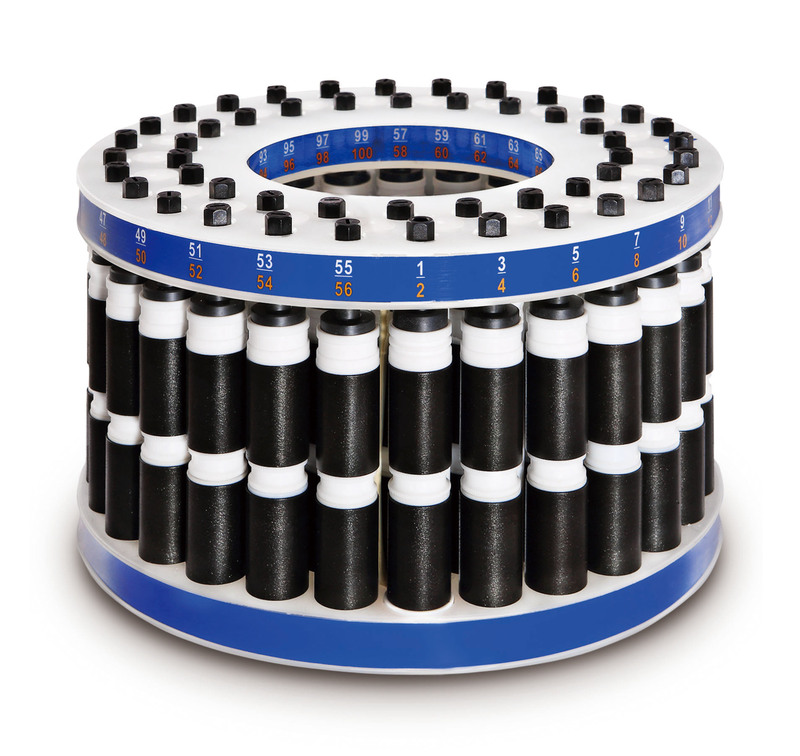 LV-200 carousel with16-200ml vessels can be reacted simultaneously, and the sample size can reach 1-2 g. Magnetic stirring makes samples be digested faster and thoroughly. The patented design of innovative Safety Bolt can guarantee the safe as well as a completely digestion. The demand of large sampling digestion can be met. 6. Wireless remote visual monitoring system make reaction be clear at a glance. Innovative remote wireless video monitoring system, makes the digestion process clearly visible. 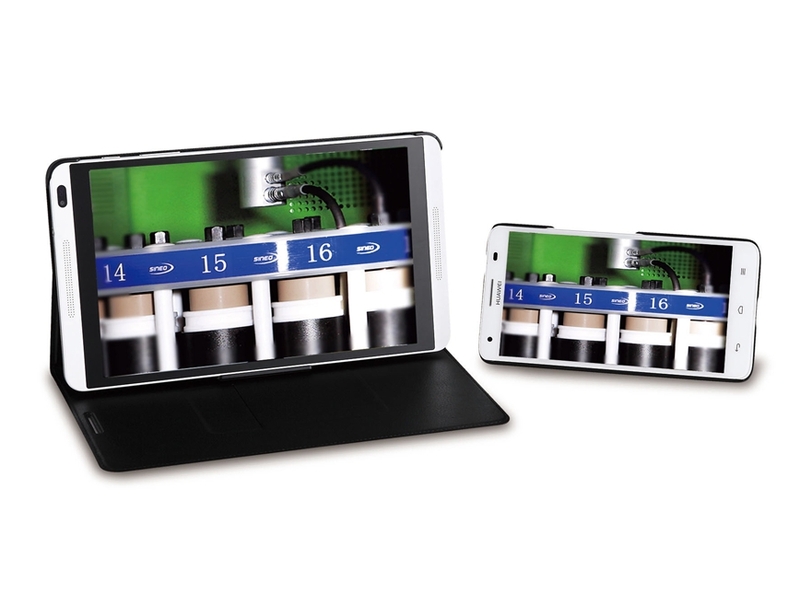 Mobile phones and tablets can realize the observation and monitoring of the reaction, making the operation safer and more convenient. 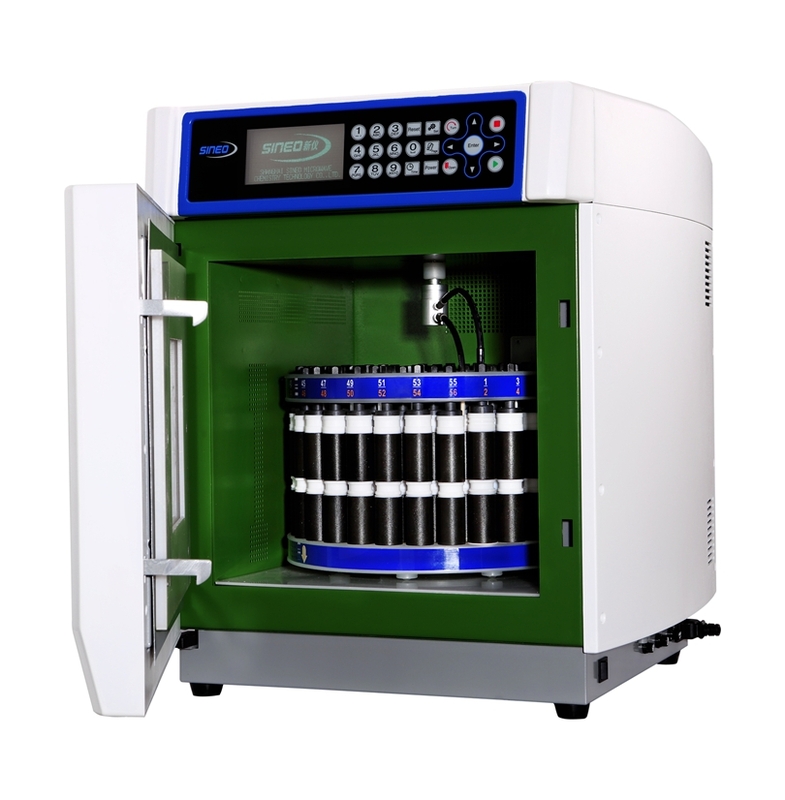 To adapt to the rapid development of advanced analytical instrument, the requirement for limit of detection, volume of sample, acid amount and blank interference are decreased, but the amount of samples to be detected are increased. Therefore, small volume, good pressure-bearing capacity and excellent batch processing performance, has become the trend for the development of microwave digestion technology. After releasing the first microwave digestion apparatus with 40 vessels at home, Sineo cooperated with National Research Centre of Geoanalysis and developed MASTER-100. Its unique UTH-Caro design is based on the previous designs and technologies of high throughput products. Such product is well received by the users in geological industry, food industry, sanitary inspection industry and environment industry. The 100-vesssel digestion carousel has 3 volume specifications, 15ml, 30ml and 50ml, and it may be customized according to the specific requirement of the user. This MASTER series product, may suit different digestion vessel sets and satisfy the requirements of users in different industries and application areas. You may use vessels and rotors in different quantity, temperature/pressure bearing capacities and volume flexibly. Regular digestion: 16-vessel independent frame type high pressure rotor and 40-vessel ultrahigh throughput carousel; Special Digestion: 18-vessel ultrahigh pressure carousel, 100-vessel ultrahigh throughput carousel and 16-vessel 200ml large volume carousel. 9. Industrial chamber structure, safer operation. Sturdy and durable industrial-grade chamber design strengthen its impact resistance, and multi-layer chemical resistant coating greatly improves the service life and safety of the system; the pop up cushioning explosion-proof sliding chamber door (Auto-Pop structure) builds a passive safety protection system, and it can disable the microwave power automatically once explosion happens; efficient exhaust system design achieves fast and safe forced air cooling (15 min cooling time from 200℃to 60℃), improving operational efficiency. 10. The complete digestion database with over 1000 methods after safety verification, and has been referred to in several international standards, industrial standards and pharmacopoeia. The high-definition LED display may show the reaction parameters and change of curves in real time on different interfaces, convenient for the modification of the setting of reaction parameters and the saving of digestion solutions as per their types.